Pycnogenol is an extract from the bark of the Maritime Pine. Proanthocyanidins, a sub group of the flavoniod family of plant compounds, are the key constituents found in Pycnogenol. 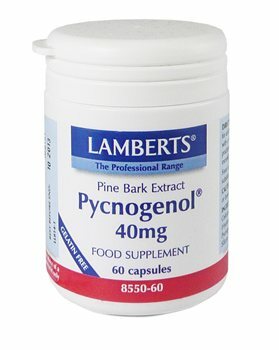 Pycnogenol (Pine Bark Extract) - 40mg. Microcrystalline Cellulose, Capsule Shell (Hydroxypropyl Methylcellulose), Pycnogenol (Pine Bark Extract), Silicon Dioxide, Magnesium Stearate.